A couple of days ago, Samsung confirmed that it would officially announce its Galaxy S9 family of smartphones on February 25 at MWC 2018. For now, the company doesn't want to say much about the S9 series, other than the fact that it's going to bring a "reimagined" camera. Nevertheless, leaked renders - and even videos - have been suggesting that the Galaxy S9 and Galaxy S9+ won't be too different from the S8 and S8+, at least not when it comes to design. In case you had any doubts about what the S9 family would look like, we can now take a peek at two renders that seemingly show the S9 and S9+ next to each other - see above. These appear to be press renders (as in: Samsung itself might be using them once the handsets are announced). 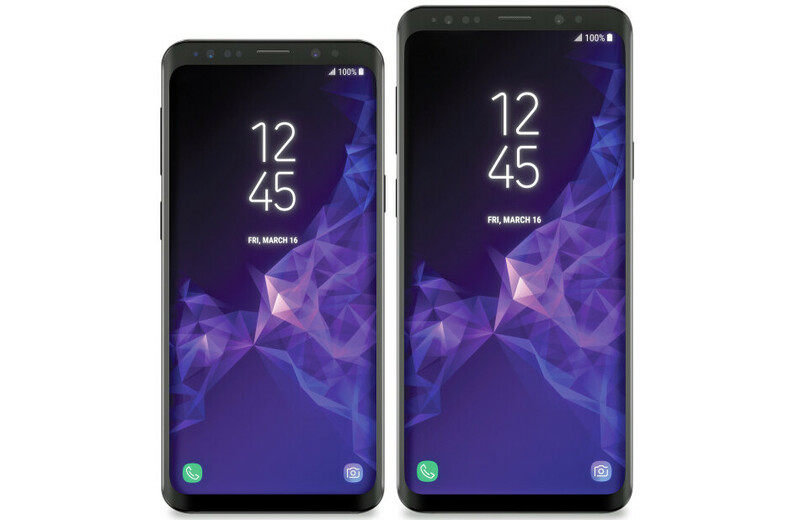 Since the images come from Venture Beat and Evan Blass (aka @evleaks - famous for revealing many, many phones before their official announcements), chances are high that this is exactly what the real Galaxy S9 and Galaxy S9+ will look like. Unfortunately, these new renders only show the Galaxy S9 and S9+ from the front. But we know that their rears is where they should actually differ from the S8 and S8+, first thanks to a repositioned fingerprint scanner. Another thing to note is that the 5.8-inch Galaxy S9 should feature a single rear camera, while the larger 6.2-inch Galaxy S9+ is expected to offer a dual rear camera. In the US, both the Galaxy S9 and Galaxy S9+ should be powered by Qualcomm's high-end Snapdragon 845 processor. However, it's said that the S9 will offer 4 GB of RAM paired with 64 GB of internal memory, while the S9+ could benefit from having 6 GB of RAM and 128 GB of internal memory. Samsung might start selling the Galaxy S9 and S9+ on March 16, or at least that's what the date seen on the phones' home screens is suggesting. These may become the most expensive Galaxy S phones to date, although, for now, exact prices can not be confirmed. We're moving towards a future where nobody is going to be able to tell which phone you've got by just looking at the front of it. Not sure if that's a good thing or not, but it's definitely a possibility. You're right, just look at the plus its Pixel 2 XL in disguise. Unless you use your phone as a status symbol, why would it be an issue if another person can’t tell what phone you have? It had nothing to do with status or any of that other stupid crap nerds spout, it is about differentiation. It'll be increasing difficult for smaller OEMs to make s name for themselves unless they add some kind of signature. Considering Samsung was one of the 1st, if not the 1st, to pull that bezeless all black front, I don't see why they should change it if the others decided to follow their lead. I'm not saying they should be worried. People are gonna buy their phones regardless, just like Apple. I'm more worried about the smaller manufacturers, who were already struggling to differentiate. I know you're not saying that Samsung should be worried regarding sales, but your comment implied that the design has been used a lot that maybe Samsung needs to change something to differentiate their product from others. Samsung is probably the only OEM who doesn't need to change much of anything. Everyone else has much more to worry about TBH. I would say they get rid of the bixby button if they don't want to give us the option to remap it. Thicker power and volume buttons, and maybe split the volume buttons in half. Anyways, now your comment makes more sense after clearing things out. I agree. But it is their fault too. Smaller bezels does not mean they need to be exactly like G6 and S8. They are doing this because they want. Whats the point of round corners on screen? Why not a rectangle? That Vivo phone with in-screen FPS looks way better than OP5T. I personally love the rounded corner screens, but I too am very curious as to why OEMs suddenly all decided to go the rounded corner screens. Like...LG made an official statement on rounded corners, saying it wasn't just an aesthetic thing, but also a durability thing. (can't find a PA article so you can just Google it) No other company has actually given a reason as to why they are going with the rounded corner displays. These are fake. The side bezels won't be that thick. Evan Blass leaked them, can't be fake. I know you're disappointed, wait for the S10 or SX. Has he ever been incorrect? These renders are poorly done to say the least. He was incorrect about the HTC One M9...that's an infamous one that most people know about. The A8 looks much 1000 times better than your amusing iPhone x. You wish as I have both the S8 and iPhone X. I would have to strongly disagree. No no no Samsung unless the better sized S9 has dual camera & 6gb ram you can take a run & jump this year. Anyone who watched the leaked video or even held an S8 will easily tell that they're fake. The bottom bezel is the same as that of the S8, and the forehead and side bezels are bigger. And that's not what the leaked video showed, plus you don't need to watch the video to realize how it doesn't make sense for Samsung to increase all four bezels when they were one of the 1st to push towards this trend. Something is off with the design. I'm not a fan of the borders. They nailed it better on the S8 or even the Note 8. Probably this is the S9 active versions... or maybe not. lol, ugly bezzel, S8/+ better, this is ugly, V30 is Best. Bad renders, not official renders or pictures.